Before we build a strategy, we first need to get comfortable with an inevitable fact: No trading strategy will work all the time. Based on fundamentals, technicals, and a whole flurry of other factors (such as future news events) – markets will exhibit distinct ‘flavors’ or conditions at various times. These various ‘flavors’ can greatly determine whether or not our strategies will be successful. If we are trading a range strategy in a trending market, the results can be disastrous, and potentially very costly. Often, it behooves us to try to trade a ranging strategy when markets are showing us range-bound behaviors. And if the market is volatile and moving quickly, then we often want to be trading a ‘breakout-related’ strategy. It’s important to keep this in mind as we build our strategies. As humans, we often can’t help but strive for perfection. Unfortunately, as traders, this can be a fatal mistake as perfection is not only impossible, but its pursuit can carry costly repercussions. Building a strategy is the art of concentrating on ‘net results.’ And focusing our strategies on market conditions specifically for which they are designed can help traders focus on producing the strongest ‘net’ results. What market condition do I want to design this strategy for? How to Pick a Condition? Markets conditions can be split into 3 groups: Ranges, Breakouts, and Trends; each with a different idea of when the best time to buy or sell might be. Unfortunately, ranges don’t last forever. Most of the time, a fresh piece of news hits the market and traders rush to bid price higher or drive price lower as that news is factored into the environment. 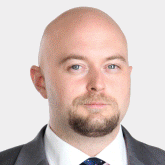 These fast markets can be highlighted by large, volatile, and unpredictable moves. 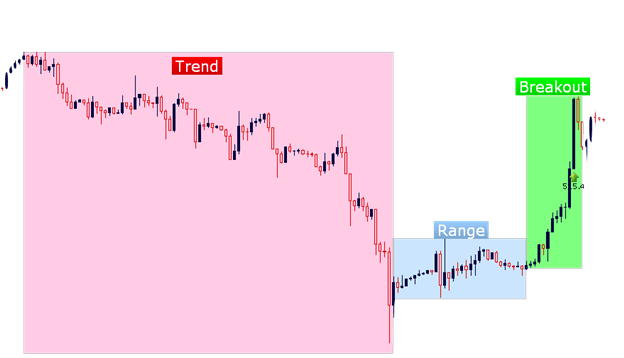 This is how Ranges become breakouts: The market environment receives a catalyst that pushes price beyond the previously defined boundaries of support and resistance. After support or resistance is broken, price can continue to run for an extended period of time. Looking to enter trades in anticipation of those breaks of support or resistance is trading breakouts. Often, entry orders (pre-set orders to open trades when prices are hit) are the preferred method of trading breakouts. When planning breakouts, it’s important to keep in mind that nobody knows when, if, or how support or resistance may be broken. So it’s impossible to determine how a breakout may take place before it actually happens; and when support or resistance is broken, how do we know that price is going to continue driving in that direction? Well – we don’t. This is quite a bit more uncertainty that is introduced to the trade, but luckily traders have a litany of factors to attempt to adjust for this uncertainty. The good news – if a trader is successful in a breakout trade, price can often run for an extended period of time, allowing the trader to collect a considerable number of pips. It’s just that with breakouts, traders will usually be wrong more often than they are right. 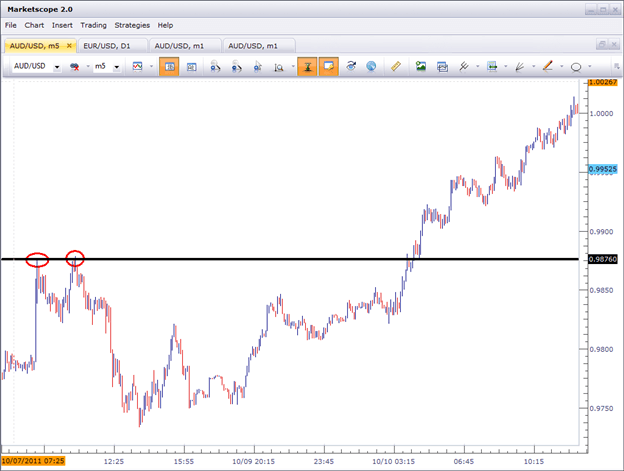 Notice that after resistance is broken on AUDUSD, price continues moving higher. As a matter of fact, after support or resistance is broken, a currency pair may go on to trend for an extended period of time. These trends can often be a trader’s best friend, offering a ‘bias’ with which the trader can look to trade in a pair. 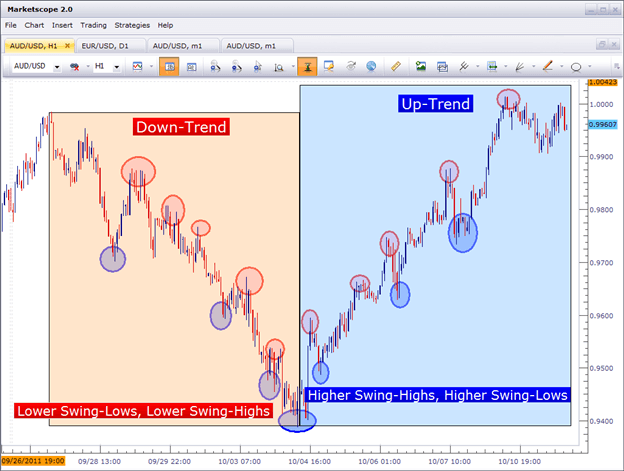 Trend traders will often wait for major levels of support or resistance to be broken so that a trend can be exhibited on the chart. Trend traders will then look to employ that same age-old mantra that range traders will employ of ‘buying low, selling high,’ only the trend trader is applying the ‘bias’ of a trend. Down-trends are highlighted by series of lower-lows, and lower-highs; while up-trends are accentuated by higher lows and higher highs. There are quite a few ways of quantifying a trend. Many traders like to rely on indicators such as Moving Averages to assist with identifying these trends. Other traders may elect to forego indicators altogether, instead, focusing on price action itself to grade trends (as we had looked at in the above graphic). In our next article, we will begin to examine the various timeframes that traders have available to place their trades. How can I learn more about basic technical trading techniques? DailyFX has daily webinars of which our expert analysts cover various topics to provide our clients with the best information on market updates and technical trading. Take a look at our Webinar calendar for access to unlimited technical knowledge!